How Does the Slope of Land Affect the Growth of Plants? Depending on how you look at it, owning land with differences in topography can be a blessing or a curse. On one hand, the changes in grade create an entirely different viewpoint than that of a flat lot. Slopes also offer micro-climates that you can use to your advantage when growing plants. The downside to a slope is that it can be difficult to establish planting beds and is more prone to erosion than that of a flat yard. The degree of slope can affect the growth of plants because of slope stability, soil type, wind exposure, erosion and root failure. Before planting on a slope it's important to understand the concept of tensile root strength, which generally has little bearing when planting on flat land. This concept essentially refers to a plant's ability to grow deep and wide enough to support the plant across a descending plane, which also helps in slope stability. It takes more strength to hold the plant upright when it is growing on a slope due to erosion, wind resistance, water run-off and the effect of gravity that stresses the root system. Plants selected for a slope should all have rapidly and deep-growing root systems. Terracing a slope creates micro-climates from one area to the next. These areas can be challenging in knowing how to utilize these natural patterns of heat and moisture. Because warm air rises and cold air sinks, the top of the hill tends to be warmer, while the bottom of the slope is colder. The direction the slope faces also affects these micro-climates, with south- and west-facing slopes typically receiving more sunlight and heat. If you are completely at a loss as to how to utilize these micro-climates, request a site analysis from a landscape architect before planting. Planting on a slope also impacts drainage, particularly if the slope is not terraced. Water has a natural tendency to collect at the bottom of a slope, while the top remains drier, but this can vary depending on the overall topography of the entire area. Place drought-tolerant, sun-loving plants toward the top of your slope and water-loving, cold-hardy plants toward the bottom for best results. Your main concern with planting on a slope is the probable erosion factor as rain washes down the slope, taking fertile topsoil and loose ground cover with it. Before planting, amend the soil and cover the entire planting area with landscape fabric to prevent erosion and suppress weeds. The key to planting trees and bushes on a slope is to provide a large enough area for the roots to take hold. For larger plants, dig the uphill side of the planting hole a bit deeper and mound up the soil on the downhill side. This keeps water and topsoil at the planting site as the roots become established. Planting on a slope that has not been terraced often affects the growth of plants due to poor planning and selection. The best choice is a native, low- or no-maintenance plant that once rooted, will not require any further attention. 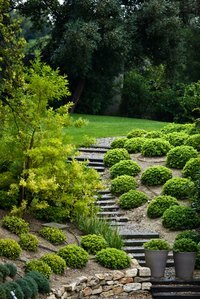 However, if you do add plants requiring routine maintenance, watering or fertilizing, build pathways perpendicular to the slope for easy access, and if necessary for safety, build steps.